Your association’s marketing strategy is one of its most valuable assets. Don’t believe us? Let’s look at the cold, hard facts. 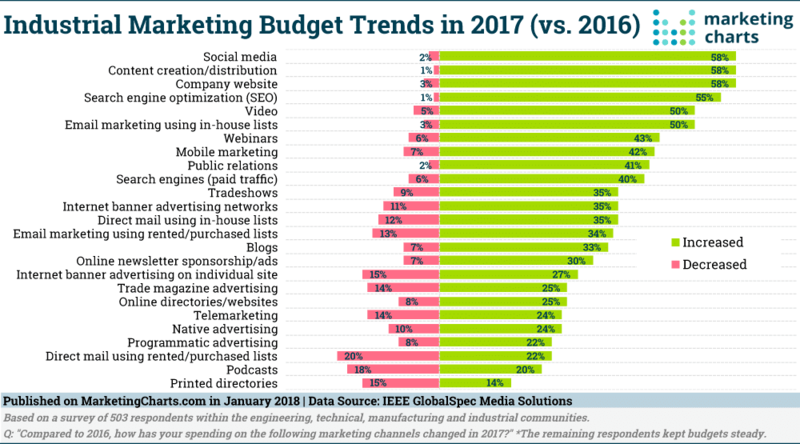 According to this infographic by Marketing Trends, the annual budget for digital marketing among organizations doubled from 2016 to 2017. That’s right, a 50% increase in budget, all towards the value of good digital marketing. With that in mind, it only makes sense that your association needs to have a strong digital marketing strategy in order to keep up with its tech-savvy members. Your association might feel like it has a grasp on the digital marketing world. But there are a lot of new trends that could help your association boost its member engagement and retention if properly taken advantage of. If you’re association is looking to tighten the screws on its digital marketing strategy, you’re not alone. Revamping your strategy doesn’t have to be a hassle. We’re going over the top tips when it comes to digital marketing and its different facets. Hopefully, your association can take away some of these tips and incorporate them into its overall marketing strategy. Here’s what you should know about the ever-changing digital marketing world. Search engine optimization isn’t a new concept for associations. In fact, we’ve written on the power of proper SEO for associations and how it can increase web traffic. But, if you’re not familiar with how SEO can work for your association, it’s time you learn. Essentially, SEO helps your association’s website get picked up by popular search engines, making your chances of bringing in new audiences much higher. So, where does SEO fit in when it comes to digital marketing? SEO is a huge part of your association’s online presence. That being said, it’s essential to your association to conduct an SEO audit regularly. According to research done by Search Engine Journal, the appropriate time to conduct an SEO audit on your association’s website is every six months. However, some associations are conducting these audits too much, too little, or sometimes not at all. Make sure your association is staying on top of its SEO scores by conducting a proper SEO audit every six months. This means auditing your website, checking to see if your site is properly optimized for search engines, or if it needs work. On top of audits, your association should be actively making sure its web content is search engine optimized. This means choosing keywords that are highly searched for and well ranked with your target audience. It also means choosing relevant images that can also be optimized. Managing your association’s SEO is an easy way to keep its digital marketing efforts up to speed. Boosting your SEO gives you a better shot at increasing web traffic, therefore increasing digital marketing success in turn. Looking to innovate your digital presence? Consider checking in on your association website’s SEO. Does your association pay for digital ads? If so, there’s a lot you need to consider in order to save money and make them a success. When speaking about digital ads, it’s important to think about cost. Many associations will fund ads by purchasing pay per click (PPC) campaigns. This means that your ads will only cost your association money if clicked on. However, it’s important to be cautious when getting into the world of PPC campaigns. You need to make sure your cost per click (CPC) isn’t taking all of the revenue you make from these ads. In the same study by Search Engine Journal, the monthly spending average for ppc campaigns varied entirely. Some digital marketers spend under $50 on their campaigns, while others reached astronomical numbers over $5,000. How do you find the right budget for your association? It’s important to weigh out all factors when incorporating ad campaigns into your digital marketing strategy. Displaying ads can bring a lot of attention to your association, but you want to make sure the costs are outweighed by the gain. You also want to make sure your digital ads make sense. What does this mean? Well, you want your ads to directly reflect your association. This means proper branding, style, and appropriate placement on ad sharing sites. Make sure your ads are hosted on channels that are regularly viewed by your association’s target audience. Without these views, your association is wasting hard earned money on ads that aren’t making an impact. Start small with digital ad campaigns and slowly build from there. It’s better to experiment with less money than to dive into a big investment with your eyes closed. If you’re looking to create digital ad campaigns for your marketing strategy, approach with caution and do your research prior. Everyone knows about the power behind social media for digital marketing success. But is your association using social media to the best of its abilities? According to Social Media Examiner, 97% of marketers are currently participating in social media, but 85% of participants aren’t sure what social media tools are the best to use. In addition, did you know that 2.8 billion internet users are using social networks? These statistics are still continuously growing as mobile device usage and mobile social networks increasingly gain website traffic. So, your association needs to be on its best social media behavior. In order to stay on top of digital marketing trends, it’s essential to master all areas of social media marketing. When running campaigns on social media, it’s always important for associations to keep track of their efforts. But how should this be done? To start, you need to understand what metrics are most important to track. Engagement is one of the most valuable metrics to track for social media campaigns, with conversions coming close behind. Once you figure out exactly what to track, you then need to figure out the best method to track it. Google Analytics is a powerful tool many associations use to track their social campaigns. However, if you’re looking for a simple method that is easy to find and navigate, you can utilize the analytic features many social media apps host. And finally, your association should know which social media apps work best for outreach/engagement. According to results from the Search Engine Journal report on digital marketing trends, Facebook is still the most popular social media outlet for digital marketers. Yes, Facebook continues to reign at the top of all marketers’ social media charts. While Facebook seems to hold the crown, it’s important to remember that social media promotion is different for every association. You want to make sure your social media outreach fits your target audience and reaches them on a channel they actively use. Digital marketing is one of the most important forms of marketing in today’s technological age. Don’t let your association fall behind on the trends. Use these tips on three very different digital marketing facets to boost your association’s digital marketing strategy forward. By taking these tips into consideration, your association can stay ahead with members and hopefully see an increase in marketing success in the near future.